A close look at hand prints within a prehistoric rock shelter finds that they belonged to reptiles, and not to our species. For decades, it has been assumed that hand prints made around 8,000 years ago on the walls of an Egyptian rock shelter represented human hands, but new research finds that they actually belonged to one or more reptiles. The discovery, which will be reported in the April issue of the Journal of Archaeological Science, adds the rock shelter - called Wadi Sūra II - to the very short list of places containing animal stencils made with actual animals. "Animal hand or foot stencils are not as common as human ones in the rock art record," wrote Emmanuelle Honoré and colleagues. "Emu foot stencils are evidenced in the Carnavon Gorge and the Tent Shelter in Australia, choike/nandu (birds of the genus Rhea) stencils in the rock art of La Cueva de las Manos in Argentina, bird stencils in Arnhem Land in Australia, among others." "All these animal stencils are made with tridactyl (three-toed) feet," continued Honoré of the McDonald Institute for Archaeological Research and her team. "As such, as far as we know, the Wadi Sūra II shelter would represent the first record ever identified of non-human pentadactyl (five toed or fingered) hand stencils in the world of rock art." The researchers launched their investigation after noticing that the hands were not as human resembling as previously thought. Yes, they have five digits, but from there, the similarities end. The hand stencils are very small, for example, such that even earlier teams concluded that human babies must have made them. Honoré and colleagues took detailed measurements of each hand stencil on the walls of the rock shelter, located in the Egyptian part of the Libyan Desert. They did a comparative study, looking at human newborn hands and even those of pre-term babies. They still couldn't make a match. 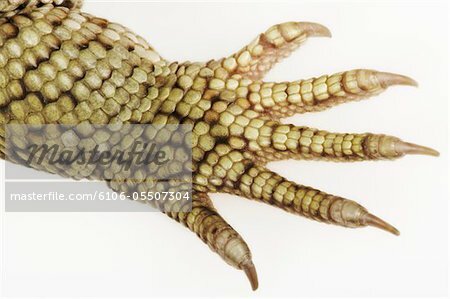 Next, they looked at the hands of other animals that also have five digits. These included a 4-year-old crocodile from the zoological garden at the University of Tel Aviv and adult monitor lizards from the wild as well as the Zoo of Moscow. The reptiles surprisingly proved to be a better match. You can see what one looks like here. As for how the stencils were made, the researchers believe that they were crafted "by placing a hand or animal foot on the surface rock, and then blowing a pigment onto the substrate to create an outline or a negative image of the hand or foot." Given the scientists' conclusion that the hands were reptilian and not human, many of the images in the rock shelter take on new complex meanings. For example, one wall features stencils of actual human hands with the tiny reptile hands on top of them, as though they are being held by the person. This arrangement would "seem to indicate a close - if not fusional - connection between animals and human(s)," according to the authors. They concluded, "Our identification of the use of an animal - most probably a reptile - hand or forefoot as a stencil in the rock art of Wadi Sūra is a significant discovery that sheds a new light on the symbolic universe of the Early Holocene populations from the Eastern Sahara." Stencil painting at the rock shelter Wadi Sūra II in the Egyptian part of the Libyan Desert. New research concludes that the hand stencils show reptilian, and not human, hands. The oldest and most widespread collection of prehistoric cave and rock art in the United States has been found in and around Tennessee, according to a new paper in the journal Antiquity that documents the art. It provides intriguing clues about what life was like for Native American societies more than 6,000 years ago. That is the age of the newly discovered cave art, one of which is seen here, showing what appears to be a human hunting. Other images are of a more direct spiritual/mythological nature. A very large polychrome pictograph depicts humans, serpents and circles. The image, from the same overall site, but extending into Alabama, likely illustrated a myth spread across generations via word of mouth, with such permanent imagery further preserving its meaning, lost to history. He and his colleagues suspect that the open-air rock art and the cave art were connected as part of “an organized alteration of the landscape,” with the creators of the images mapping “their conceptual universe onto the natural world in which they lived.” This happened in three dimensions, with upper (celestial in nature), middle (plants and animals) and lower (darkness, death and danger) worlds matching content with where it was placed in the region. Analysis of rock and cave art often employs non-destructive, high-tech tools, such as this high-resolution laser scanner operated by the RLS group in Chattanooga, Tenn. It precisely records the ancient art for conservation and analysis. Scorpions, with their painful stings, appear to have been part of the Native American vision of the “lower world.” At this extensive site, scorpion images were found in deep caves and not in the upper “celestial” area. In this case, an artist, or artists, produced the images by painting wet ashes onto the cave wall. “These tiny turkey engravings from Tennessee were extremely difficult to photograph, since they are only a few centimeters long and composed of very shallow lines made with a fine pointed tool,” Alan Cressler, project photographer, told Discovery News. “One of the best-known examples of Southeast cave art, these engravings of weapons and bird-human transformations form a complex composition in the dark zone of Devilstep Hollow Cave in Tennessee,” Simek said.